Plans for several major developments in and around Inverness are to be considered by councillors next week. Planning permission has been sought for a new justice centre which would move criminal and civil courts business out of historic Inverness Castle. Go-ahead for a new railway station at Dalcross near Inverness Airport has also been sought. Councillors will also consider notification of a proposal for a new prison in Inverness. The Scottish Prison Service has submitted a document to inform Highland Council that it is preparing a planning application for the new HMP Highland on a site next to Inverness Retail Park on the A96. Full planning permission has been sought for the Inverness Justice Centre. It is to be developed on the site of a former bus depot between Longman Road and Burnett Road to the north of Burnett Road Police Station. The new centre would allow the courts service to move out of Inverness Castle, clearing the way for the 19th Century building to be turned into a tourist attraction. 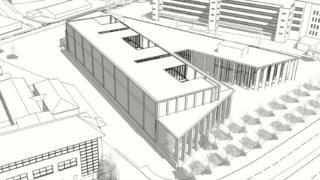 The Scottish government is to fund the construction of the new two-storey justice centre. Building a station at Dalcross, near Inverness Airport, has been a long-standing aspiration of Hitrans, which promotes improvements to public transport in the Highlands. Hitrans has applied for full planning permission for the new station on the Inverness to Aberdeen line, as well as a 150-space car park, access for buses and taxis, a bike stand and electric-vehicle charging point. Meanwhile, Eastgate Unit Trust has sought permission to add a single storey, glazed extension to a C Listed historic building which houses a restaurant in Inverness' Falcon Square. All the proposals are to be considered by Highland Council's south planning applications committee on Tuesday.